With most of us ready to kick 2016 to the curb, there’s never been a better reason to get out and do something big for New Year’s Eve. This Saturday, put on something fancy/freaky/celebratory and get yourself to one of these amazing experiential parties. Take a cue from Dali at the Second Annual Surrealist Ball at the Roxy Hotel, or go Black Tie with Soho Grand’s Masquerade Ball. 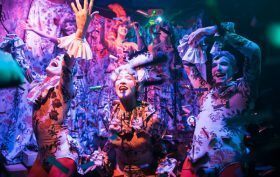 Expand your Sleep No More experience with their super fancy Bohemian Ball, or get a table at Mission Chinese for Luke Neocamp’s takeover. Hang all night at an art opening by Rae BK, or go the tourist way for the 112th New Year’s celebration in Times Square. Or if you’re in Brooklyn, head to The Well for a massive Tiki Disco, or to the immersive House of Yes for a party looking to the future. Whatever path you choose, happy New Year to all!